The sacking of NRL player Ben Barber for domestic violence was a familiar response by CEO Todd Greenberg that is unlikely to yield any meaningful long-term results. As Greenberg continues to grandstand, sprouting ‘enough is enough’ in front of the media the true root cause to Barber’s – and too many other NRL player’s – abhorrent behaviour remains festering and untreated, alcohol. But the NRL pockets are lined with alcohol industry dollars, so we are forced to watch this tiring version of Groundhog Day – bad player behaviour, punishment, repeat. When revelations of a shocking spike in domestic violence during the State of Origin games was released last year, the silence from NRL Headquarters was deafening. If they had responded, the NRL would have been forced to admit they need to end the toxic booze culture they have created in their playing ranks and in their many fans through the heavy sponsorship and promotion of alcohol in the sport. But because there was no player the NRL could conveniently fine, suspend or ban or otherwise scapegoat the NRL elected to remain silent. 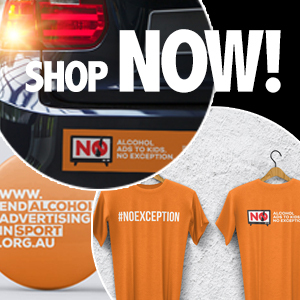 Alcohol is involved in the majority of all domestic violence cases, and until such time the NRL are willing to address the issue of alcohol head-on, it’s impossible not to remain sceptical about the sincerity of the NRL when it says ‘enough is truly enough’. As it stands, the game of NRL remains drenched in alcohol advertising. In last year’s NRL Grand Final there were over three alcohol ads per minute, with many of the spectators of the game young impressionable children. The State of Origin series is much of the same. Until the NRL decide to rid themselves of the alcohol sponsorships, Australians will have to endure more abhorrent behaviour from the game’s players and more Todd Greenberg press conferences. On the Summer Series today, we look back at a series of posts calling on the NRL to get their own house in order. Data released last year revealed that on NRL State of Origin game nights, there is a staggering surge in domestic assaults in NSW. A volatile mix of alcohol, heightened emotions, and competition is contributing to these this vile domestic violence spike. And because alcohol brands blatantly use the association of sports to encourage consumption, the NRL shoulders some of the blame for due to its excess promotion of alcohol. The NRL upping the punishment for player Jack Wighton’s drunken violence was a typical case of grandstanding by Greenberg and the NRL and hypocrisy of the highest order. The sporting code must do more than admonish its own players. The NRL must recognise its duty of care beyond its own professional base to the wider community beyond the stadium gates. The code needs strong and proactive leadership to ensure it is not fostering and encouraging violence. An obvious and good place to start would be for the NRL to sever its strong alcohol sponsorship ties. The sad irony of Blake Ferguson’s is an all too common one in the NRL. Off-field incidents derail a player who displays great potential early in his career. The player cleans up his act and reaches greater sporting heights than ever before thanks largely to self-imposed booze ban. Then the player is rewarded for their good form by being covered in alcohol advertising.